You are currently browsing the tag archive for the ‘West Pier’ tag. 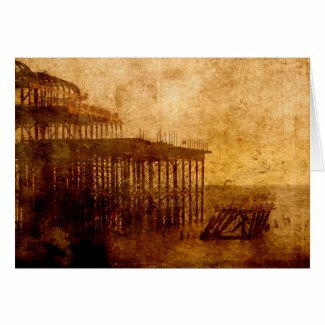 I’m putting my cards on the table to tell you I’m in love with my latest piece, a burnt-out pier! I keep looking at it in Photoshop and giving a contented sigh or two! And this I say coming straight from a conversation with Vanessa Couchman about the difficulty of promoting your own work after an upbringing which taught us never to put ourselves forward or show off — if anything, we were directed to show off the work of others. “I don’t think it gets any more comfortable but one becomes more proficient at it,” said Vanessa. She’s right. It’s something we have to do on social media if we are to get any attention. That said, I’m not feeling remotely uncomfortable telling you of my love on this occasion; I wonder why. I began with this photograph by Victoria Alexander at Unsplash (loving this site of free, high-resolution photographs, if you hadn’t already guessed). I used one texture — 2LO Distressed 11 from Denise Love at 2 Lil’ Owls, bought via Design Cuts – and another from Lenabem-Anna J. on Flickr. There followed a great deal of blending and stretching and tweaking before it was done. I hope you like it too. If you do, as Olga Núñez Miret says at the foot of her posts, you know what to do — like, comment and share!